The stems of plants raised in the dark elongate much more rapidly than normal, a phenomenon called etiolation. 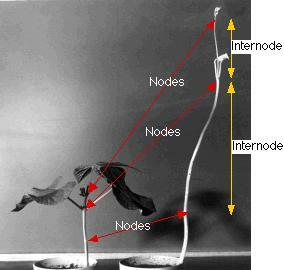 It is a mechanism that increases the probability of the plant reaching the light. the plant begins to produce internodes of normal size. The image shows seedlings of the common garden bean grown in the light (left) and in darkness (right). The pale color of the dark-grown plant is caused by the lack of chlorophyll. When the food reserves of its seed are used up, the seedling will die (unless placed in the light). Each seedling has three nodes (the bottom ones where the cotyledons were attached), but the internodes are greatly elongated in the dark-grown seedling. This response is NOT dependent on photosynthesis, because light too dim to be useful in photosynthesis nevertheless halts etiolation. Exposure to dim red light (660 nm) or blue light can halt etiolation. The effect of blue light is mediated by cryptochrome. The red light effect is mediated by phytochrome. The prevention of etiolation in Arabidopsis is mediated by phytochrome B. When sunlight (660 nm) converts PR into PFR, the PFR moves from the cytoplasm into the nucleus. There it stimulates the activity of DELLA proteins. These bind to members of a group of helix-loop-helix proteins called PIFs ("phytochrome-interacting factors"). PIFs, like many helix-loop-helix proteins, are transcription factors. They bind to and turn on promoters of genes that, among other effects, stimulate cell — and thus stem — elongation. However, when DELLA proteins bind PIFs, the PIFs are prevented from binding to the promoters of their target genes. The result: reduced cell elongation and so no etiolation. Natural sunlight contains about the same amount of red (660 nm) as far-red (735 nm) light. However, chlorophyll absorbs 660 nm light strongly, so that the light that filters through a canopy of foliage is enriched in far-red light. This is absorbed by PFR converting it into inactive PR and relieving the inhibition of PIFs. The now-active PIFs turn on the genes needed for the synthesis of auxin. The shade-avoidance response helps ensure that the plant reaches enough sunlight to be able to carry on photosynthesis.